The Shed as seen from the High Line, Feb 2019. Photo by Brett Beyer. NEW YORK, April 5, 2019 – Peace of Mind Technologies (POM), a leading security, audio/video and low voltage integration company based in New York City, is excited to announce that one of the most unique projects it has worked on, The Shed, launches its opening season today. 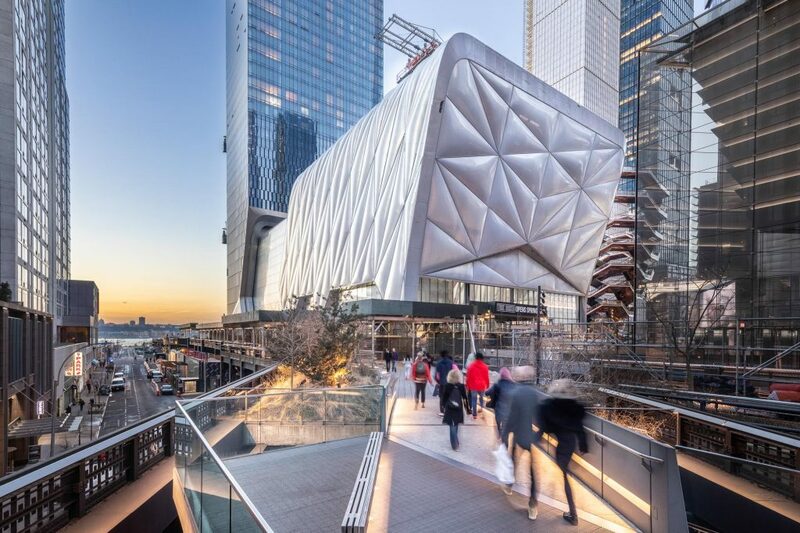 Located on Manhattan’s west side where the High Line meets Hudson Yards, The Shed is a nonprofit cultural organization dedicated to commissioning, developing and presenting all kinds of performing arts, visual arts and pop culture. The eight-level, 200,000-square-foot building is versatile, with a movable outer shell that allows the space to expand or retract depending on artists’ needs. The Shed features The McCourt—an iconic space for large-scale performances, installations and events; two column-free gallery floors; a multipurpose theater; and a rehearsal space, an artists’ lab, and a large, sky-lit event area all in top-floor The Tisch Skylights. POM became involved with the project back in 2015 under Sciame Construction. Given The Shed’s unique design and intent to host hundreds of guests, it required a large-scale, customized security plan with integrated technologies. POM’s experience in integrating security solutions for large and complex projects provided the needed expertise to meet these expectations. The Shed now has a seamless integration of the most sophisticated surveillance, access control, visitor management, intercom and alarms systems. Peace of Mind Technologies, LLC (POM) is New York’s premier systems integrator for security technology. Specializing in high-tech systems, cloud-based software services and audio/video solutions in the greater New York Metropolitan area, POM’s diverse client roster comprises a wide range of prestigious and well-known businesses.